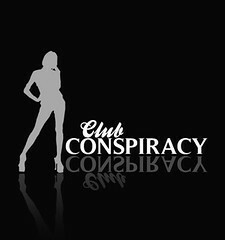 AVENUE Models proudly presents the launch of Club Conspiracy. 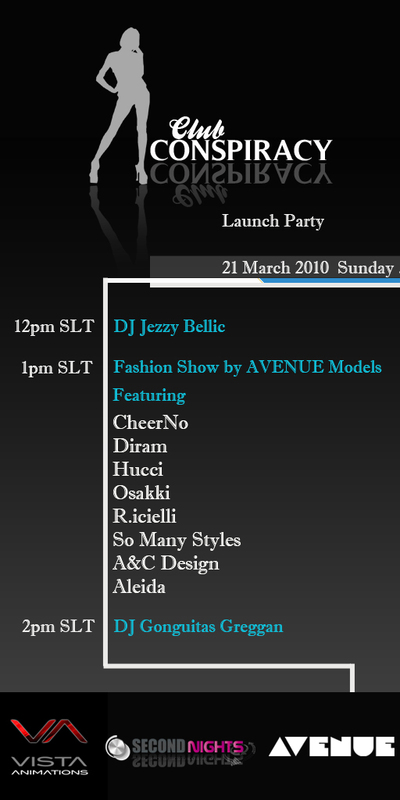 Join us Sunday, March 21st @ 1PM SLT as we bring you House Music at it’s finest with DJ’s Jezy Bellic and Gonguitas Greggan and fashions from CheerNo, Diram, Hucci, Osakki, R.cielli, So Many Styles, A&C Design and Aleida. 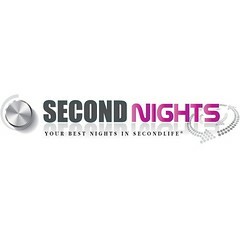 Danni Dollinger had been in Second Life® for less then a month when she fell in love with the House Music scene. Along the way she met many significant people in the industry, although “there seemed like there was nothing around, but slowly a few clubs opened and struggled to pull in a strong crowd,” says Danni. As the House movement in SL™ has now grown, clubs are attracting experienced ‘real-life’ DJ’s, Danni herself has grown and built a new experience to shadow her love. Now 3 years later Danni brings us Conspiracy. Offering a new twist, Conspiracy is for everyone, from the newcomer, like Danni herself once was, to become introduced into the scene, to the avid SL club goer. “My dream for Conspiracy is to be part of the movement, I wanted to create a club where people can come listen and relax from their daily stresses to some REAL music from REAL Djs who are about the music and the love of it”, says Danni. With it’s own vibe and personality, Conspiracy will soon be a driving force in the House Movement, experience it for yourself. For more information please contact Danni Dollinger. AVENUE Models, the premier modeling agency in Second Life®, is well known for their professional organization of lavish and creative fashion events driven by unique and effective marketing and promotions. 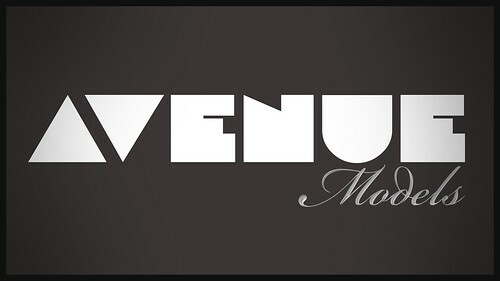 AVENUE Inc, the parent company of AVENUE Models, AVENUE Studio, AVENUE Models Academy and AVENUE Magazine, was founded by Rusch Raymaker, CEO in 2007. 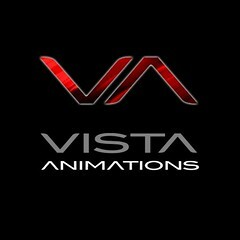 With a team of highly professional and qualified fashion, creative and marketing professionals, AVENUE strives to continuously promote the Second Life Fashion Industry to a higher level. Leading the first fashion track and publishing AVENUE Magazine in print at the Second Life Community Convention 2009, AVENUE continues to break new grounds in fashion marketing and publishing within and outside of Second Life. For more information please contact Jesika Contepomi, Chief Marketing Officer for AVENUE Inc.